Though the Rapid ʻŌhiʻa Death (ROD) crisis has been brewing for years, the first-ever summit to specifically address this matter was held in Honolulu barely a month ago. Plans were made on long-term strategies of how to deal with the disease, while short-term solutions appear to remain the same. Since ROD’s first outbreak in 2010 and later identification in 2014, research has narrowed down the primary cause. A fungus called Ceratocystis fimbriata infects the inner part of the tree and cuts off water supply to the rest of the plant. This lack of water is what causes the best-known symptoms of yellowing at the top of the tree and then death. Plants can be infected only through open wounds such as broken or trimmed branches. The Ceratocystis fimbriata fungus is not native to Hawai’i or we would have encountered it previously. Current hypotheses are that it was brought in from an outside source, it mutated from an outside source or it is a mutated combination of multiple fungi. All this information and more can be found in ROD handouts distributed in various local areas, like schools and the airport. While this isn’t the first time the ʻōhiʻa have been threatened, ROD is a significant problem because “The fungus, Ceratocystis, is not going to go away,” said Corie Yanger, Educational Specialist, Outreach Coordinator for ROD and UH Hilo alumnus, in an email. There was a “phenomenon of ‘ōhi‘a dieback that received a lot of attention in the 1970s and 1980s,” Yanger said. “There are several peer-reviewed publications available on this subject on the Rapid ʻŌhiʻa Death website. Researchers of ʻōhiʻa dieback searched exhaustively for a pest or pathogen (fungi, bacteria or virus) that was causing the widespread death, but didn’t find one. Eventually, they attributed the dieback to a phenomenon called “cohort senescence” where large areas of similarly aged trees naturally die off,” Yanger said. Another difference between the previous ʻōhiʻa dieback and ROD is that the dieback only occurred in particular areas. ROD, on the other hand “Does not seem to have any limitation to where it can occur at this point. The disease has been detected from low to high elevation, dry to wet conditions, and young to old trees. That is what is so frightening about this disease,” Yanger said. Talking about “solutions” for ROD is complicated. “[ROD] will not be eradicated. Once a tree is infected by the fungus, the tree cannot be cured. For individual trees, once they are infected, life might be prolonged by applying a chemical that inhibits fungal growth (fungicide),” Yanger said. “Potential chemicals are currently being studied. If a suitable chemical is found, it won’t be able to keep forests alive, rather individual trees that are of value to people. A fungicide would have to be applied for repeated intervals to ensure the chemical is effective. The tree would live as long as the chemical is applied. If the chemical treatment stops, the infected tree would eventually succumb to the disease,” Yanger said. “It’s difficult to think about a “best solution” to stopping ROD because we still need more information, more research about the possible ways that the disease is spreading,” Yanger said. While other organizations are most certainly trying to figure this one aspect of the problem out, UHH is pursuing other helpful avenues of research through Blaine Luiz, a graduate student in the Tropical Conservation Biology and Environmental Science (TCBES) Master’s in Science (MS) program and Dr. Ryan Perroy's lab within the Geography department. Luiz’s project involves measuring various descriptive characteristics of a single species of the fungus Ceratocystis. “I’m also inoculating different varieties of ʻōhiʻa with the pathogen to try and find any resistance to infection that may be present in the host [ʻōhiʻa] itself,” Luiz said. “The latter part of my project will mainly be a first look at resistance in ʻōhiʻa, as there is a lot of genetic diversity in natural populations of ʻōhiʻa, and testing the entirety of this diversity will take a great amount of time and resources.” Luiz works in conjunction with UH Hilo professor Elizabeth Stacy and the leading pathologist for Rapid ʻŌhiʻa Death, Lisa Keith, located at the USDA Daniel K. Inouye Pacific Basin Agricultural Research Center. Dr. Perroy’s lab is “Using drones to survey and monitor about 100 acres of forest along Stainback Highway that has been affected by ROD. They survey on a monthly basis and have about one year's worth of surveys. Dr. Perroy's lab has also been assisting with surveys of forested areas where new detections of ROD have been made -as in the recent detection in Laupāhoehoe,” Yanger said. Surveying is important for perhaps gaining insight into the way the fungus spreads, and the characteristics of the trees and areas affected. Protecting the ʻōhiʻa is a community effort. “There have actually been many students from the elementary and intermediate schools reaching out to us for projects on ROD,” Yanger said. “UH Hilo students can help by raising awareness about ROD in their community reporting suspected cases of ROD, and following our 5 simple recommendations to prevent spreading ROD. Students can learn more at www.rapidohiadeath.org and engage with us on Facebook www.facebook.com/rapidohiadeath. Those who are interested in carrying out their own ROD research or education are welcome to contact us,” Yanger said. Something helpful that locals could do is “Learn how to identify ROD. All of the leaves on a seemingly healthy ʻōhiʻa tree will turn from green to yellow to brown within a few days to weeks. The fungus can’t be seen on the outside of the tree –it grows within the wood. If the fungus is present, a cross section of the tree trunk would display a dark radial stain. The only way to confirm that a tree has died from ROD fungus is to collect a sample. 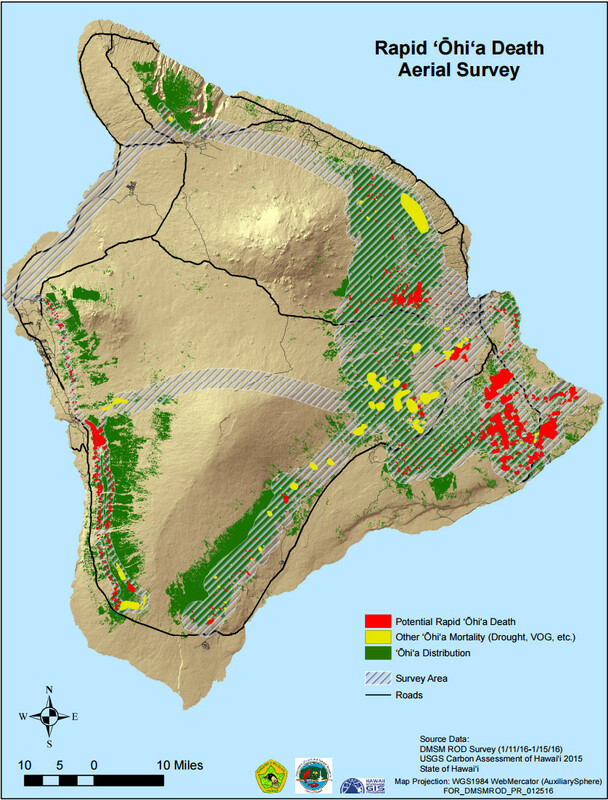 More information on sampling at the Rapid ʻŌhiʻa Death website,” Yanger said. “If you suspect an ʻōhiʻa tree has ROD on Hawaiʻi Island, please contact UH Extension Forester J.B. Friday with a description and photos at jbfriday@hawaii.edu. Finally, we can all help prevent spreading ROD when we: 1) Don’t move ʻōhiʻa plants, foliage or wood, 2) Don’t transport ʻōhiʻa to another island, 3-4) Clean gear and shoes of soil and debris with a brush and 70% rubbing alcohol before and after entering forests, and 5)Wash vehicles with soap and water to get mud out of wheel-wells and tire treads, especially after off-road driving,” Yanger said.